But the most clandestine event of all might well be the Electronic Gaming Summit. Held at the Silverado Resort in Napa Valley, it's sponsored by Ziff Davis Media. Attendance is invite only, and only 100 invitations are sent out each year. An executive from Ziff Davis once explained to me that no press ever attended the event, in order to make sure that panelists would speak their minds. Less than two months later, the New York Times reported from the event, noting, "The Video Game Industry Has an Image Problem and Mostly Itself to Blame." After 30 hours of presentations, you can understand just about anything. Once, I attended a three-day conference on artificial intelligence. Through the years, I learned an appalling amount about the business of games, development and even exactly how to produce and market a conference. Between sessions, unsolicited advice abounds. For me, it was mostly in the form of ideas for articles, stories and interviews. "Don't ever cover CES in Las Vegas," I was told by one veteran reporter, because that show is a madhouse that makes E3 look like a calm lake. And one rapacious CEO told me his secret for success with booth babes. "Disarm them with humor." Once, at South by Southwest, the editors from Make demonstrated exactly how a Roomba robot vacuum cleaner could be converted into a real-life Frogger and sent back and forth across a busy downtown street at 2:00 a.m. Continuing education aside, the consumer events give an entirely different look at the industry. 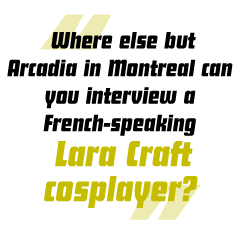 Where else but Arcadia in Montreal can you interview a French-speaking Lara Craft cosplayer? Where else but VGxPO can you watch the sun rise over Valley Forge? Where else but QuakeCon in Dallas can you see Scandinavian youth carrying CRT monitors that weigh three times what they do? But covering every game-related event across the world can be taxing, and I saw the toll it takes on colleagues and friends. There must be more to life than looking for power outlets, Wi-Fi hotspots and cell phone reception. If you look at the cost of conferences, individual participation can be exorbitant. It costs thousands of dollars to register for the larger events, hundreds for airfare and hundreds more for hotels. Meals and taxis add up. And when you're at a convention, you're not getting any regular work done. So why are these events so vital, and why do we insist on going to them, no matter the cost? The answer has to do with the nature of the people in the videogame industry. They are, by and large, the best and the brightest. And though they are strange people, they are not anti-social as outsiders might suspect.